Successfully Added Cup Warmer and USB Hub with Clock to your Shopping Cart. USB powered cup warmer and USB hub with clock. 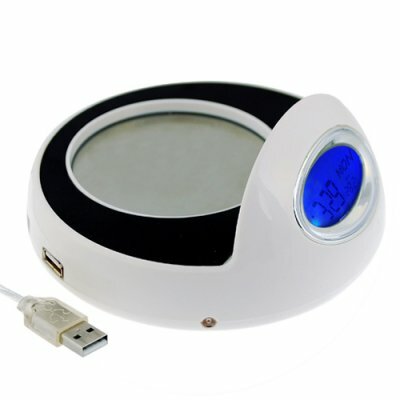 Advanced design USB powered cup warmer with 4- port USB hub and illuminated clock with date for use on your desktop. Why suffer with cold coffee when you are "in the zone" at your computer? With this convenient cup warmer you can have a constantly warm cup/mug of coffee or tea. The CVSB-K22 cup/mug warmer has black tone insulation material around the metal heating plate for safety along with a red status light to let you know when the heating plate is active. After warmed, the warmer keeps your coffee/tea at a constantly warmed temperature for your continued enjoyment. Also useful for small mugs of soup, oatmeal and congee (we tested it here). Simple on/off switch lets you turn it on and off without having to unplug any cables. All that is needed is a simple USB port to plug into and you are ready for the long workday or night ahead. We are offering this unit at a quantity of at least 5 pieces in order to give you the absolute best re-sale profit margin from our low wholesale price and even better shipping rates. 4-port USB 2.0 hub for powering other USB devices. Will this work with my Mac or Linux computer? Do draw power for heating, it should work with any USB enabled computer. However, the USB hub will only work with Windows computer. Will the clock work when my computer is off? Yes, the clock works independently of your computer.